There have been many imitators, but there is only one duo in North America sanctioned by Dan Aykroyd and Judith Belushi to don the official hat and sunglasses and walk in the legendary footsteps of Jake and Elwood Blues. 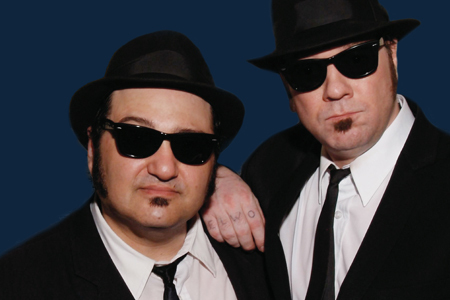 Discovered in Las Vegas, performers Wayne Catania and Kieron Lafferty capture the infectious humor and unbridled spirit of the Blues Brothers like no one since John Belushi and Dan Aykroyd walked the stage. Backed by a powerhouse band, they’ll give you a show to remember, packed with classic hits from the Blues Brothers catalog, including Soul Man, Rubber Biscuit, Sweet Home Chicago, and more. For a night of laughter, dancing, and foot-stompin’ fun, book the Official Blues Brothers REVUE today.